As the mom of 2, I get it...dinner time is hard. You're normally pulled in a million directions and the last thing on your mind is how on earth you're going to get a wholesome, home-cooked dinner cooked for your family. What if I told you that I have the secret to serving your family a well-rounded meal, every single night, with under 30 minutes of effort each night? 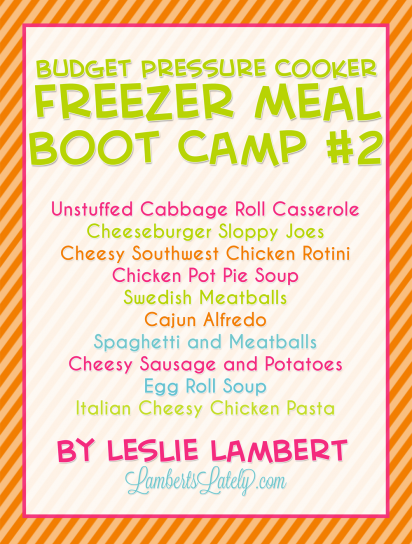 Let me introduce you to your new best friend: the Freezer Meal Boot Camp! change the way you get dinner on the table! Head to the purchase section - click here! 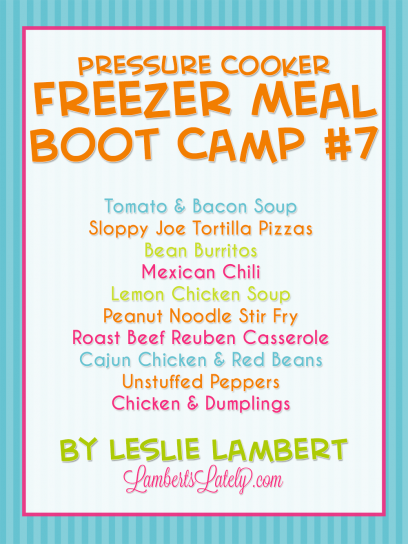 After I released the original IP Freezer Meal Boot Camp on my blog, people went nuts for the idea! 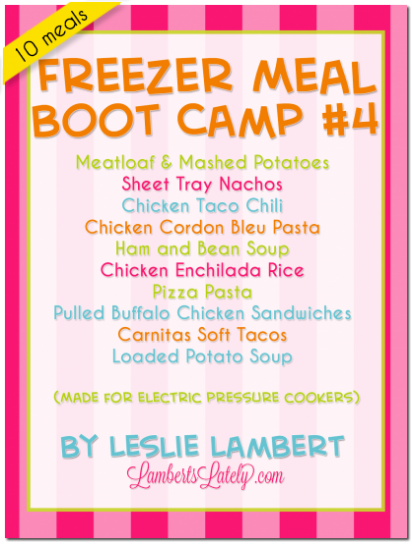 After tens of thousands of pins and hundreds of thousands of views (and even a mini boot camp follow-up), I knew I wanted to continue to provide easy, time-saving meals for busy families. Want unlimited access? Click here! Browse through my menus and purchase the menu packs that your family will love...no complicated subscriptions or paying for plans you don't need! You'll get thorough instructions to shop for and prep multiple meals at once, as well as several types of printables to help you organize your meals. 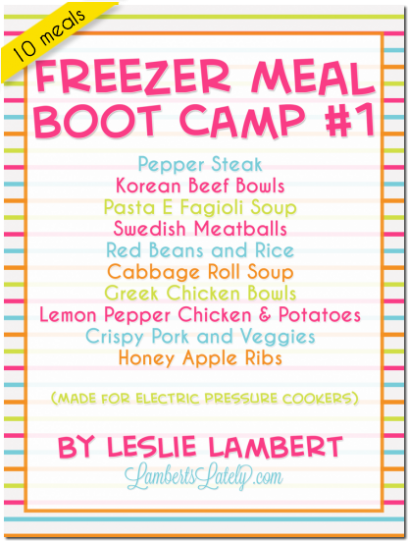 Once you decide on and purchase a plan, follow the step-by-step directions included in the Boot Camp to prep and freeze your meals. My prep sessions typically take anywhere from 2-6 hours, depending on the number of meals you're making that day (5-meal plans take closer to 1-2 hours; 30-meal plans take closer to 6). When you're ready to eat a meal, remove from freezer 10-15 minutes before cooking, follow the simple instructions for serve night preparation, and enjoy easy, homecooked, no-fuss dinners for days (even weeks) at a time! By making several meals at in one session, you streamline the meal prep process. I normally spend around 15-30 minutes a night cooking my freezer meals. That means more time to spend with my family! 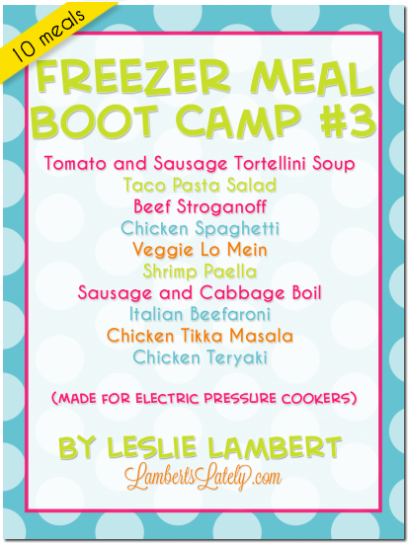 Since you'll be freezing these meals, they will be waiting for you when you're ready...no more dealing with old/expired meal ingredients or resorting to costly restaurant meals when you're short on time. You can also buy ingredients in bulk when prepping with this method, saving both time and money at the grocery store. Your days of scrambling to plan meals at the last second are over! 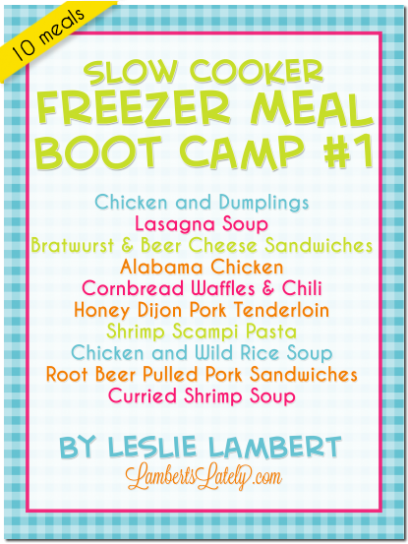 You know that you will consistently have a great stash of wholesome dinners for your family. 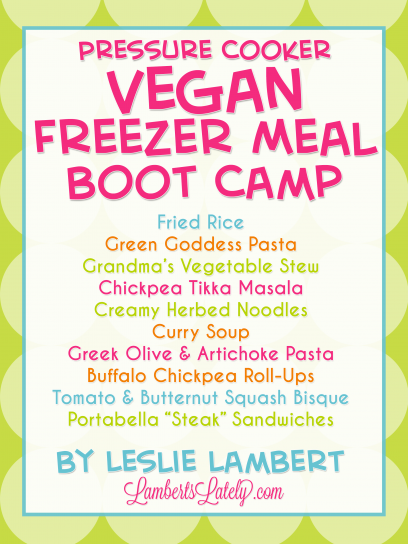 You'll also know exactly what you're feeding your family, unlike many pre-packaged meals. Printable grocery shopping list for every ingredient you'll need to prep and serve your meals. serving amounts, instructions, and prep time for each meal. 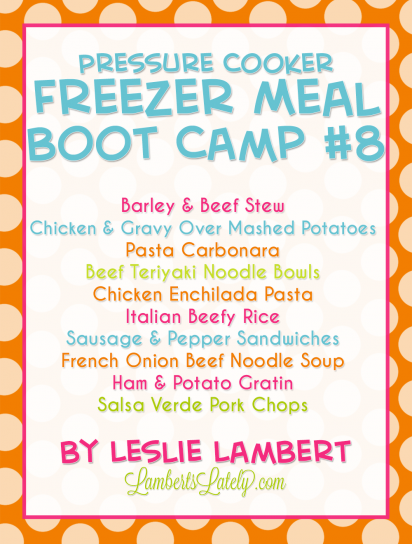 Step-by-step instructions for assembling your meals for the freezer. Recipe card printables for each meal that list the details needed to recreate your meal later if needed. A thorough list of supplies you'll need to make your meal prep as easy as possible! Ready to snag a free FMBC pack? 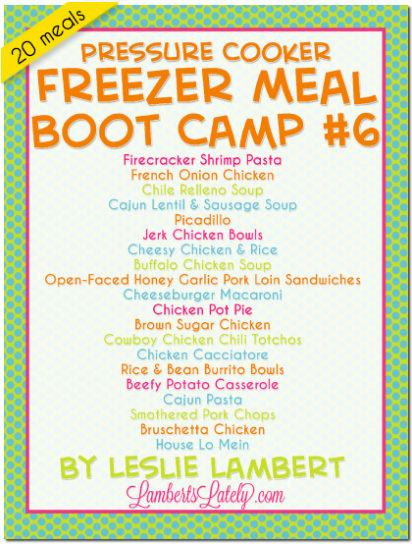 You can get a Freezer Meal Boot Camp pack for absolutely free...right now! 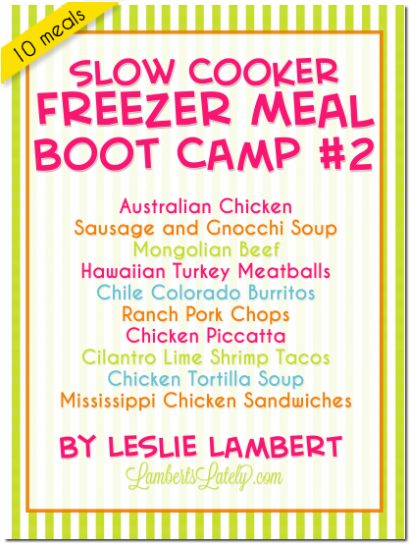 This set of meals originally appeared in my Mini Instant Pot Freezer Meal Boot Camp and has since been formatted into a free sneak peek of my premium FMBC packs. Sign up to get your copy using the form below! 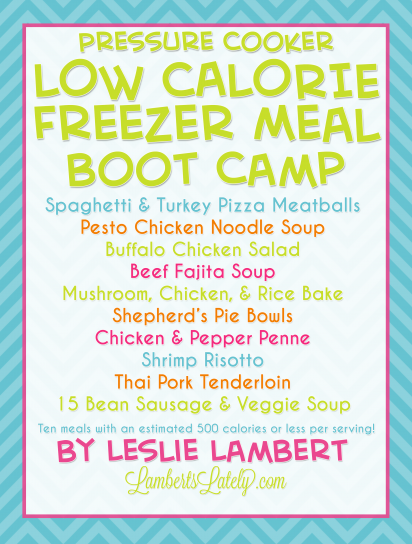 Purchase your Boot Camps by selecting from the menus below! 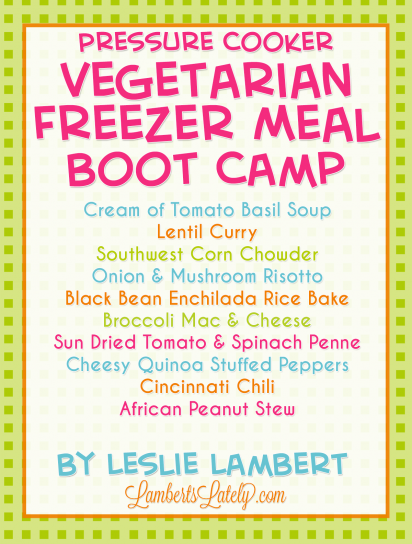 All Boot Camp packs are instant digital downloads. You'll receive your purchase via email within minutes! 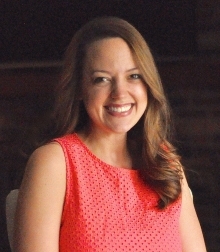 leslie at lambertslately dot com with the number of the pack for which you'd like to see an ingredient list. 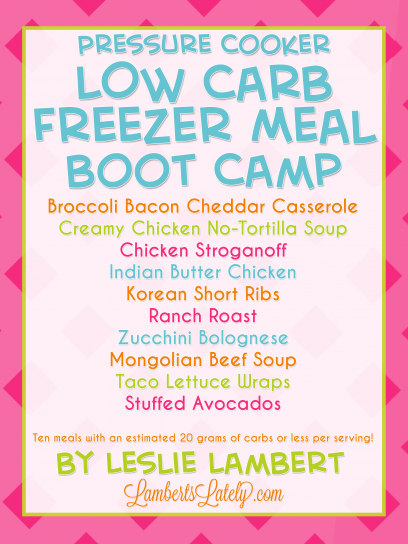 This pressure cooker low carb freezer meal pack includes 10 meals with an estimated* 20 carbs per serving or less! 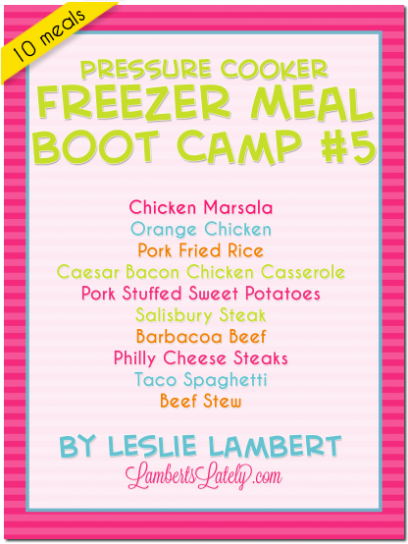 This pressure cooker low calorie freezer meal pack includes 10 meals with an estimated* 500 calories per serving or less! *Any nutrition information is an estimate. Actual nutrition info for prepared recipes might vary by brand or type of ingredient and should be verified by user. 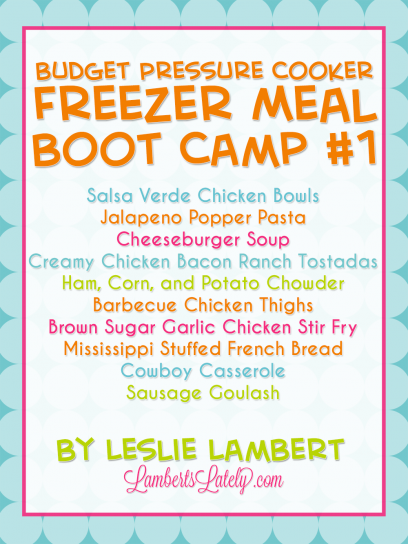 Budget meal plans each feature 10 meals and, including side dishes, should cost around $100 to prep and serve (depending on your area). That's about $2 a serving! NEW: Packs #7 and #8 are available! 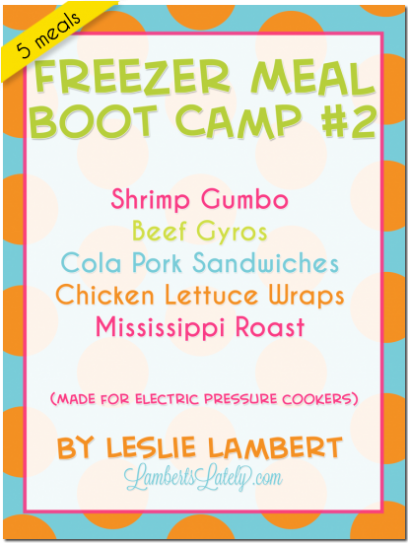 The lifetime Freezer Meal Boot Camp membership is for you! For one low price, you'll get access to every single boot camp above and will be emailed new boot camps as they're released. Give me the Lifetime Membership! Want updates when future Boot Camps are released? Sign up for the latest updates below!